Taking its name from another literary masterpiece, Sancho Panza served the errant knight as his faithful squire in the famous 17th Century Spanish novel by Miguel de Cervantes- Don Quixote. 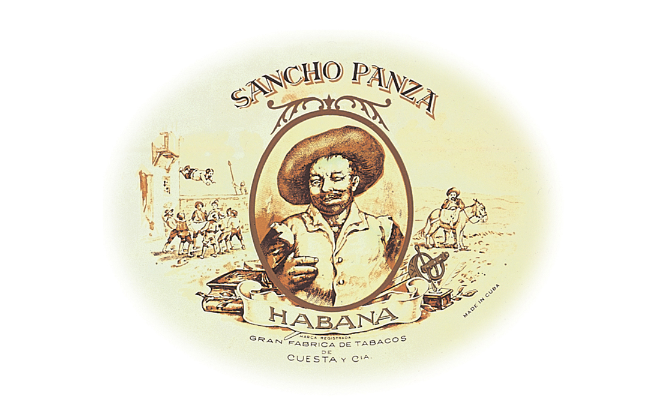 Sancho Panza brand is believed to have been created, along with El Rey del Mundo, by German businessman Emilio Ohmstedt in 1848 as a premium brand. Spanish businessman Antonio Allones took over the brand sometime around 1882. Under Allones, the brand reached the height of its world-wide prestige. In 1905, Allones’ company was bought by the Díaz Hermanos y Cía venture, owned by Cándido Vega Díaz (supposedly the namesake of Don Cándido cigars), which was later renamed the Rey del Mundo Cigar Co. to reflect its most famous asset. The company also produced Rafael González. The range today includes an example of the largest size of Habano available, the 9+ inch long Gran Corona known simply as the ‘Sancho’.